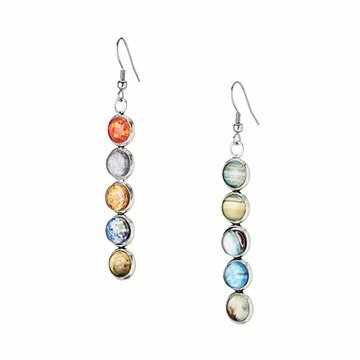 Celebrate the solar system in celestial style with these charming mismatched earrings. Celebrate the solar system in celestial style with these charming mismatched earrings. Lauren Beacham nestles glass beads into silver-toned brass bezels, highlighting tiny giclee prints of the fiery red sun and our one and only Earth all the way to Neptune—and even little Pluto! Gift these stellar French hook earrings to the fun science teacher or dreamy stargazer in your life. Handmade in Maryland. Make it a set! Click here to see the matching Solar System Bubble Bib Necklace and Solar System Bubble Cuff Bracelet. Very pretty and eye catching. Not too heavy so they are comfortable for her to wear all day. Bit of a science geek so love having the planets including Pluto! Best of all they are colorful and stylish. Loved All items purchased from UncommonGoods! Well, my niece uses the product, so I guess she puts them in her ears and walks into the sunlight! My husband purchased the necklace and bracelet as gifts & he didn't purchase earrings because they were pricey, and I have a lot of earrings. I later purchased them for myself, and I agree, they were costly, but unique! My friend really loved these earrings. These are so much smaller than they look even in the picture on the woman. Each circle is only slightly larger than a pencil eraser making it unlikely anyone will recognise the planetary connection. Even knowing what it was, the Earth was almost discernable. I chose the earrings over the bubble necklace as I was afraid it would be too large. Now I'm thinking it may have been a better option. For the cost, I anticipated a little more. These are lovely earrings and I get a lot of compliments and reactions of "ooh" when people realize what they are. They have, however, broken, with Uranus and Pluto disattaching. I haven't had them very long and don't mistreat them so am very disappointed. The same thing happened with two of the bracelets of the same design. So, sadly, I can't recommend these. Nice mix to match the necklace. People are curious about the difference in the earrings that's a secret!!!!!!!! !